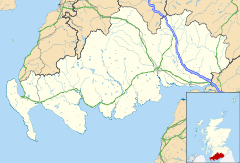 Dumfries (/dʌmˈfriːs/ ( listen) dum-FREESS; possibly from Scottish Gaelic: Dùn Phris) is a market town and former royal burgh within the Dumfries and Galloway council area of Scotland. It is located near the mouth of the River Nith into the Solway Firth. Dumfries is the traditional county town of the historic county of Dumfriesshire. Dumfries is nicknamed Queen of the South. The nickname has also given name to the town's professional football club. People from Dumfries are known colloquially in the Scots language as Doonhamers. The Theatre Royal in Dumfries. In the background can be seen the spire of the old St Andrew's Cathedral: the rest of the building burned down in 1961  and was replaced with a new church on the same site. West Sound FM, part of Bauer Media Group, broadcasts from Dumfries. And is also the main radio station for the area. Community radio station Alive Radio 107.3 broadcasts on FM for Dumfries and online. In 2018, Dumfries got a new radio station - Dumfries Community Radio Also known as DCR Online is not a traditional FM radio station, but is an online radio station. DCR has a big passion and a great for the town of Dumfries. ^ ceu[email protected], Scottish Government, St. Andrew's House, Regent Road, Edinburgh EH1 3DG Tel:0131 556 8400 (20 August 2007). "Support for Crichton and South of Scotland". 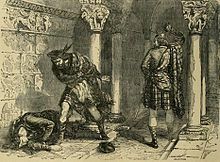 This page is based on the Wikipedia article Dumfries; it is used under the Creative Commons Attribution-ShareAlike 3.0 Unported License (CC-BY-SA). You may redistribute it, verbatim or modified, providing that you comply with the terms of the CC-BY-SA.